The 1940 Pride and Prejudice Film: Where’s the Chemistry? This post is the first in a series of reviews to complete the “Aficionada” level of Laurel Ann Nattress’s P&P Bicentenary Challenge celebrating 200 years of Jane Austen’s Pride and Prejudice, 1813-2013. As you know if you know me, or have explored my “About” page, I grew up in Santa Fe, New Mexico. Santa Fe is the place Greer Garson lived later in her life after marrying Texas oil man E.E. “Buddy” Fogleson and retiring to their “Forked Lightning” ranch in New Mexico. Santa Fe benefited greatly from her patronage when she endowed the (then) College of Santa Fe (now Santa Fe University of Art and Design) in order to build the Greer Garson Theater. This was a place where I spent a considerable amount of time one season because my brother had gotten a small role in the musical Carousel. The way I remember it, at the entrance to the orchestra seating for the theater (or maybe in the lobby area) there were two larger-than-life portraits of Miss Garson flanking the doors. I remember in the one on the right she was wearing a splendid green outfit, corseted and fitted, with a green feather in her hat, which was most likely a costume from That Forsyte Woman (1949), designed by Walter Plunkett (costume designer for Gone With the Wind among other iconic films). 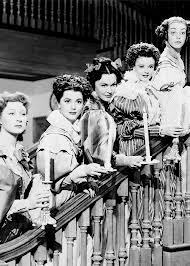 My overall evaluation is that the 1940 adaptation was frothier and played for more obvious laughs than Jane Austen’s original. 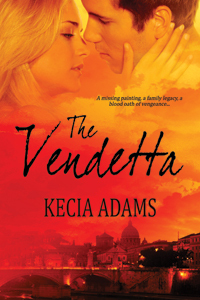 I enjoyed the film, but it lacked the character depth present in the novel and (some) later adaptations. Specifically, the necessity of condensing the story for a 2 hour film completely negated the dramatic reversal at the midpoint when Darcy delivers his letter to Elizabeth and all is revealed about George Wickham. And the screenwriters took out my favorite part: the visit to Pemberley where Elizabeth meets Darcy on his own turf. The sublime tension of that moment where so much can be misunderstood but each is inclined to think well of the other…the fact that that moment is missing from this version deflates the whole second half of the movie. The supporting cast, as is frequently the case in P&P adaptations, was brilliant. 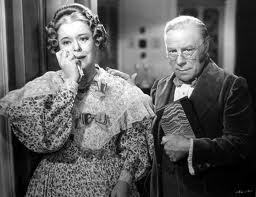 Particularly Mr. Bennet played by Edmund Gwenn (from Miracle on 34th Street) and Mrs. Bennet played by Mary Boland. In addition, Frieda Inescort was icily condescending as the disapproving Miss Bingley. Much has been made in other reviews of the costuming. These are not the classic Empire waisted dresses of the Regency period. However, they are from just a little later, the Romantic period (late 1820s-1830s), under the reign of George IV (the former Regent himself). I actually enjoyed the costuming because it was consistent throughout the film. In other words, if you are going to pick a period, stay there and don’t mix and match. And of course, this film did receive an Academy Award for Art Direction. Now for the main characters. 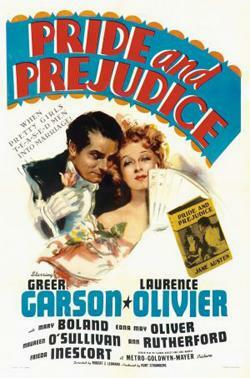 As I watched this version , I couldn’t help but notice two things: first, there was no chemistry at all between Greer Garson as Elizabeth and Laurence Olivier as Darcy; and second, the great Laurence Olivier never seemed to capture the spirit of Mr. Darcy, and the role sat oddly on his admittedly broad shoulders. I was curious whether their stiffness with each other was just a characteristic of acting in general at that time, or specifically of these actors, so I viewed some clips of other contemporary films with the same actors opposite different leads. 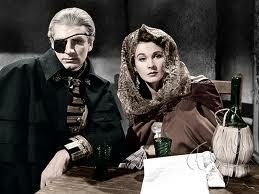 The contrast was startling for both Greer Garson and Laurence Olivier. Laurence Olivier is perhaps one of the greatest actors of all time, honored with 10 Oscar nominations for acting (winning once), in addition to awards for directing and honorary awards. 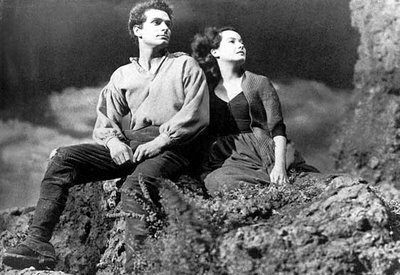 Mr. Olivier was smoldering and brilliant as the moody Heathcliff in the adaptation of Emily Bronte’s classic Wuthering Heights (1939), but his awkward gestures as Darcy were distracting, almost effeminate, and his voice nasally. 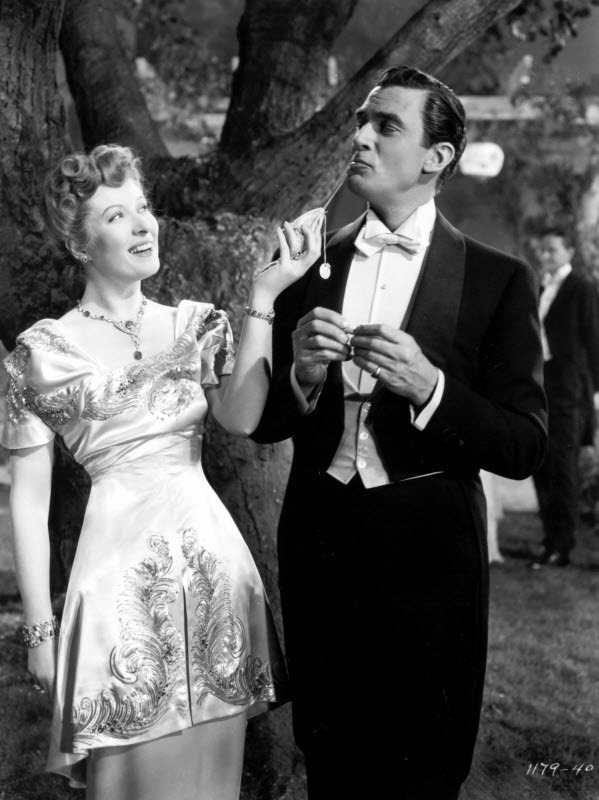 Meanwhile, Greer Garson took home an Oscar in 1942 for her portrayal of another literary figure, Mrs. Miniver, playing opposite the gawky everyman actor, Walter Pidgeon. She would go on to star in 7 more films with Pidgeon, including 1941’s Blossoms in the Dust pictured left, and garner 7 total Oscar nominations in her career. I thought her performance as Elizabeth was charming and clever, except in the scenes with Darcy where she seemed to be trying too hard. Olivier and Garson were arguably the best performers of their age, just not perhaps in these roles or with each other. Vivian Leigh, the actress best known for her role as Scarlett O’Hara in Gone With the Wind (1939), was the love of Laurence Olivier’s life. Even while they were both married to other people, their affair was an open secret in Hollywood, which paralleled the roles they played opposite each other in That Hamilton Woman (1941) as Jane Austen’s contemporaries, Admiral Lord Nelson and Lady Emma Hamilton. The costumers played fast and loose with the Regency era costumes in that movie too. Greer Garson, nominated for an Academy Award in 1939 for Goodbye Mr. Chips, lost out to Vivian Liegh (also a British actress) who won for Scarlett. When Greer Garson won the Oscar in 1943 for Mrs. Miniver, her acceptance speech was the longest in Academy history, clocking in at over 5 minutes. You have her to thank for the “get off the stage” music of today’s Award show. So, do you watch the old black and white movies? Do you find the acting of that era stilted in general, or is it role or actor dependent? What did you think of Olivier’s Darcy? Happy Anniversary, Pride and Prejudice! is (for me!) a perfect moment to announce my participation in Laurel Ann Nattress’s P&P Bicentenary Challenge. If you have been reading along, you already know I am a Jane Austen fan! In fact, this post on Jane’s Irish connections apparently was my most viewed in 2012. 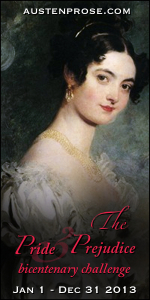 Time-line: The Pride and Prejudice Bicentenary Challenge 2013 runs January 1, through December 31, 2013. Levels of participation: Neophyte: 1 – 4 selections, Disciple: 5 – 8 selections, Aficionada: 9 – 12 selections. Enrollment: Sign ups are open until July 1, 2013. First, select your level of participation. Second, copy the Pride and Prejudice Bicentenary Challenge 2013 graphic from the Austenprose blog and include it in your blog post detailing the novels or movies that you commit to reading and watching in 2013. Third, leave a comment linking back to your blog post in the comments of the Austenprose announcement post. OR, if you do not have a blog you can still participate. Just leave your commitment to the challenge in the comments section of the P&P Bicentenary post. I hope you will join me as we celebrate Jane Austen’s lasting legacy through the most popular and well-known of her novels, Pride and Prejudice.